Signal transmission in electronic applications and data communications cables now have to accommodate faster signal speeds over longer distance with less signal loss. 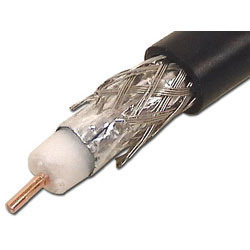 In addition, new shielding requirements to meet FCC RFI/EMI emission controls, tougher fire/temperature requirements requiring special materials in critical installations and demands for high density wiring are factors that have been considered in many of our coaxial and data cable products. Our products are designed to meet these needs for safe and reliable transmission of voice, video and data. Standard RG/URM/JSS/JIS Type Coax for commercial and defence use. Triaxial cables-balanced lines for reduced crosstalk. Networking load for LAN, WAN, ETHERNET, ARCNET, NOVELLAN, DLINK and other complex applications. Dual Coax-workstation Coax for large word processing System. EVEREST® co-axial cables are widely used today for hi-tech multi-channel cable TV networks in high rise buildings, offices, hotels. hospitals residential complexes, etc., and has gained confidence among viewers by delivering high quality picture and sound. EVEREST® co-axial cables are made of high conductivity electrolytic grade annealed bare solid copper conductor with special grade polyethylene/gas injected physical foam PE dielectric. Bonded aluminum foil screening in combination with tinned copper braiding, jelly-filled ensures low loss in signal quality and clear pictures. The double screening provides better attenuation values compare with cable with single screen. After screening, the outer jacket is extruded with special grade PVC which is UV and abrasion resistant. Excellent adhesion of insulant to conductor, as well as bonded aluminum foil to dielectric does no allow the moisture to enter the cable. This makes it ideal for use in tropical conditions. Low loss in signal quality. Looking for Radio Frequency Coaxial Cables ?